A couple of weeks ago, I talked about how we can offer a print version of our book, even if we’re self-published. I have Treasured Claim available at Amazon through their CreateSpace service, but my plan for other retailers is to use IngramSpark for distribution. Many authors stick with CreateSpace because, as with much of their business approach, Amazon makes things easy and user-friendly. If we check off “Expanded Distribution” in our account, CreateSpace can distribute to other channels, such as bookstores and online retailers. However, it seems to be hit-or-miss whether bookstores actually want to work with Amazon (the enemy! *smile*) for print copies. So a few authors are now combining what they see as the best of both worlds. Depending on the specifications of our book, Amazon/CreateSpace’s royalty for in-Amazon sales is often better than what we’d receive for Amazon sales through another distributor. So some authors are sticking with CreateSpace for Amazon sales but distributing to other retailers through the “neutral” IngramSpark, which is part of Lightning Source. 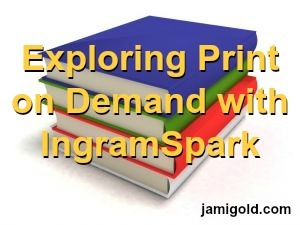 I’m still working on the second part of that plan for the non-Amazon distribution, but my friend Kerry Gans recently went through the print-on-demand (POD) process with IngramSpark, so I asked her to stop by today and share her insights and tips. Please welcome Kerry Gans! I recently wanted to self-publish a genealogy book for my father’s family. My first stop was Amazon’s CreateSpace, since most people use that service. It seemed simple enough—until I found out that their page limit for color books was 480 pages. My book was 504 pages. I then turned to Lightning Source, which I had also heard good things about, although I had been told they were more for small presses, not geared toward self-publishers. However, Lightning Source had recently launched IngramSpark, a service aimed at self-publishers and more user-friendly than Lightning Source proper. The main difference I found between the two is the upfront costs to the service. Spark requires much more upfront money than CreateSpace. Spark has a $49 set-up charge for print books and $25 for ebooks (this fee is waived if you have an initial order of 50 books or more). There is also an annual distribution fee of $12 (this fee is waived under certain conditions described below). The largest fee for most self-publishers (at least for those based in the U.S.) will likely be the ISBN fee. Unlike CreateSpace or Smashwords, who allow you to purchase an ISBN through them for a nominal fee, you must provide your own ISBN for Spark. Buying 10 ISBNs through Bowker cost me $250. But since I know I will use them all eventually, I don’t feel cheated. Honestly, if I had more cash lying around, I would have bought more ISBNs, as the price per ISBN decreases the more you buy. So, for me to create my genealogy book (printed, not ebook), I paid $299 up front. If you choose to be your own distributor with Spark (known as “short run” distribution), they waive the $12 distribution fee, since you are not using their distribution network. Since my genealogy book is for my family only, this is what I did. The actual building of your book is very similar in Spark and in CreateSpace. You start by plugging in the metadata they ask for, then upload your interior and cover files. Your interior for both will be a PDF (based on the submission guidelines they provide). Then you can use their Cover Creator templates to create your cover. While this requires attention to details such as margins, gutters, and bleeds, it is not a difficult task if you take your time. The e-proof (a PDF) was easy to manipulate, and Spark gives you 3 options: Approve, Approve but don’t distribute until I review a physical copy, and Don’t approve. I ordered a physical copy prior to distribution, and shipping of my order was fast. When I held that book in my hands, with my name on the cover, representing 20 years of work and reflecting the vision I had for the presentation of all that data, I got chills! The quality of the final book itself was very good. I am quite pleased with how everything looks. The paper is thick, and the paperback cover is high quality. Some of the photos were a bit red-yellow, but the ones that looked off were from source materials that were themselves not of the highest quality (such as pictures over 100 years old! ), so I suspect the fault was in the source, not the printing. But they were still clear and crisp, and most of the photos and other reproductions were gorgeous. Ingram Spark’s distribution network does get your book where it needs to go: Amazon, B&N, Baker & Taylor (for libraries), and, of course, Ingram itself. For distribution, Spark requires you to use a wholesale discount of 55% (you can use 40%, but this is discouraged), and you can choose whether to allow returns or not. I am putting two versions of my genealogy book out to the public—one hard cover, one paperback. The hardback’s cover price is $55; the paperback is $40. If someone bought it directly from me, the price would be closer to $35, depending on shipping. These prices will net me roughly the same profit per book. So if your goal is to get your book to customers at the lowest price, you may need to wear your distributor hat. If price to your customer is a primary concern for you, take note that I compared the pricing with CreateSpace vs. Spark. Since the public version of this book is only 414 pages, I could use CreateSpace, which was my plan. But when I checked the final price, I would have to charge $60 for the paperback in order to make the same profit as the prices above. Since CreateSpace does not offer a hardback option, I had to use Spark for that. I couldn’t bring myself to charge $60 for a paperback and $55 for hardback. So even though it cost me a little more up front, I used Spark for both. Spark has some nice features, including printing calculators and publisher compensation calculators. Although I have found that their FAQs don’t always address my questions (hopefully they will continue to modify them as they get more feedback from clients), I have found their Help staff courteous, knowledgeable, and responsive. You can email them or request a callback. Believe me, I have used their Help staff many times, as I think I have made every mistake possible during this journey! So this has been my experience with Ingram Spark. It is not quite as user-friendly as CreateSpace, and has more upfront costs, but the support staff was great and the final product was of high quality. Also, Spark seems to have more flexible print options, which might be the key for you. As to the extra money? The question you need to ask yourself is this: Will I be happy changing my book’s presentation to fit CreateSpace’s needs, or do I want it to be exactly the way I envisioned it? Ingram Spark will have a lot of work to do to steal market share from CreateSpace, but they have good points that make them a tempting alternative, in spite of the price. They did a good job for me, and I love my book! 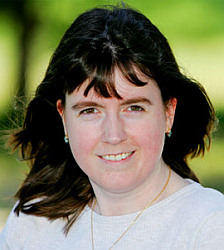 Kerry Gans is the author of the middle grade fantasy The Witch of Zal. She is a chocoholic theater geek, believes libraries are magic, and considers Chincoteague Island her perfect writing retreat. When not writing, she haunts cemeteries and dusty archives in search of long-dead ancestors and pursues her most important work-in-progress, her daughter. On The Goose’s Quill, she blogs about her journey toward publishing while parenting, and she also writes for the group blog The Author Chronicles. Kerry’s recent publications include the short story Dying Breath and a genealogy reference book The Warren Family of Philadelphia Pennsylvania, and their Ancestors. For more info or to contact Kerry, check out her website, personal blog, group blog, Facebook, Twitter, Google+, or Goodreads. A teenage girl with cystic fibrosis gets a miracle—at the price of her estranged brother’s life. Can she find peace even when she feels the wrong sibling died? Thank you, Kerry! This was a great overview of the pros and cons for dealing with IngramSpark. I’ve also heard that IngramSpark is the way to go for international print distribution. I believe Amazon currently prints only in the U.S., which requires international shipping to Europe, Australia, etc. However IngramSpark can also print in the UK or Australia, reducing the cost for many international customers. Also, depending on the specifications of our book, such as number of pages or a color or black-and-white interior, Kerry’s note about Amazon’s costs for printing being higher might not apply for sales within Amazon’s system. (For example, my royalties for CreateSpace print sales within Amazon’s system are over twice what they would be if I went only with IngramSpark and used them to distribute to Amazon.) So be sure to check the specifics for your book before making final decisions. Have you considered using IngramSpark? If so, why—what pros and cons have you heard? How does it fit into your publishing strategy? If you’ve worked with IngramSpark, how would you compare the two? Do you have any questions for Kerry? I saw Robin Cutler speak on behalf of Ingram Spark a few weeks ago at Bay Area Book Festival. It’s nice to see them garnering more interest! That’s good to hear! I think we can all agree that it would be good if Amazon isn’t a monopoly, so I like bringing attention to our other options. 🙂 Thanks for the comment! Hi, Stacy! Glad to hear that they’re garnering more interest. Their product is high quality, they deserve some love. 🙂 Thanks for dropping by! Talk about a timely piece. I’m into the final editing of my first nonfiction book. I had assumed that CreateSpace was the only viable game in town. Looks like I need to give IngramSpark a close look. This may be the better choice for me. Also recently my local library could not get a book (on writing) in that I requested because the distributor they contracted with would not supply any product from CreateSpace. Something to check on if your book is library material. Yay! Good timing. 🙂 Oh! Great point about options for library books. Thanks for sharing! David – One good thing about using Ingram is that you get the reach of all of Ingram’s distribution, including libraries. And their hardcovers are beautiful (since you’re non-fic, I didn’t know if you’d be thinking hardcover at all). Glad this post found you at the right time to give you options! There may be more than one place with an IngramSpark discount, but the one I’ve heard of is through ALLi. Thanks for the comment! Cool! I just joined ALLi as an author member. I’m not using Ingram just yet, but their Facebook group, newsletters, and blog posts look very helpful, as well as many other things. Thanks for telling me about them! I got my CS book in about July 2013, so yeah two years ago too. Recently I ordered a friend’s book which she recalled was published with CreateSpace, so I was surprised that the paper was thin! Maybe I should try reordering my book now to see if the paper quality is better. *fingers crossed* lol. Still, I’m very glad that CreateSpace improved on the one thing I didn’t like that much about it, haha. So I re-ordered my book, they said the delivery time would be in about 2 weeks, and it arrived in 2 DAYS not including the public holiday, lol! Haha I know CreateSpace has unexpectedly quick deliveries, but I didn’t expect something as dramatic as this…I’m very impressed, lol. There’s a lot of misinformation floating around and repeated here, and I don’t blame anyone, but here’s my two cents, as an actual publishing professional: when using IngramSpark or Lightning Source, you’re not actually getting access to Ingram’s distribution machine. That’s not how distribution even works in book publishing—what you’re getting is them acting as wholesaler, and there’s a big difference. Yes, the books they carry may be made available for purchase by bookstores, but almost none of them actually get stocked. Why would they? There are thousands and thousands coming at them all the time, and they don’t know about yours, and most self-publishers shoot themselves in the foot anyways—they don’t make the books returnable, they don’t offer the industry-standard discounts, etc. When Ingram really distributes a book (or periodical, or whatever), they’ve got a little skin in the game, and their regional reps try to sell booksellers on stocking those books on their roster for that season. This is not the case with self-publishers. None of this is to say they’re a bad self-publishing option or anything like that—they’re as good as anything else—but people who think they’re going to upload their book to IngramSpark, hit a button, and be on bookshelves a few weeks later are sadly very delusional. Does nobody notice that thousands of people do this every month, and there aren’t a million books in bookstores? LOL! I don’t disagree with anything you say here. 🙂 However, as self-publishers don’t have the option of true distribution, they tend to lump the distribution and wholesaling functions into one, especially in a case like Ingram, where the company does both functions in different facets of their services–and especially from an online store perspective. In other words, most self-published authors understand that POD distribution just means that their books are available (by special order) but not actually stocked on shelves. The most we can hope for in most cases is listings in online stores, and for online listings, the lines between the function of distribution and wholesaling are wavy. That said, it’s good to reiterate that point in case not all self-published authors are aware that a simple listing with IngramSpark wouldn’t result in their books being stocked in stores. Thanks for bringing up that issue so we could add those clarifications!